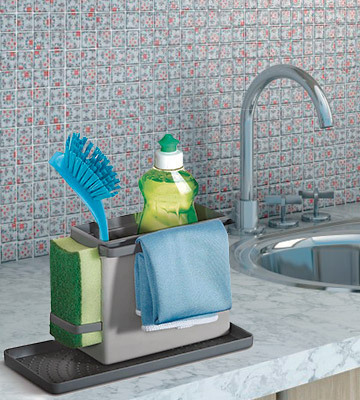 Fitted with an integrated rail, this sink tidy offers enough hanging and drying space for damp dishcloths. You can easily dismantle the whole thing and just as easily clean it. The concealed reservoir beneath it does an excellent job collecting any drained water, making it ready for disposal. The plate doesn't fit bigger sponges. Joseph Joseph 85070 is one of those products that manages being equal parts practical and visually appealing. Provided you don't mind paying a little extra, what we have here is easily the best kitchen sink tidy on this list. The organiser's enamelled metal exterior is as visually appealing as it is sturdy, able to resist rust and corrosion, partially thanks to the powder-coated finish. The wooden handle is foldable. The main compartment has ample space for your cleaning tools and detergent(s). The wooden handle doesn't cope well with moisture. 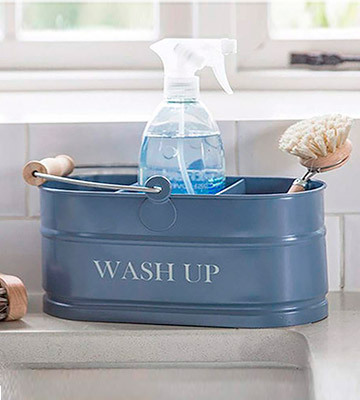 This sink tidy will work wonders for people who aren't just looking to keep the sink area neat and organised but also add a little character to their kitchen. Regardless of its interior design, the model will make a charming addition to any room. Thanks to that middle insert, among other things, the model can be used as a sink tidy and as a cutlery organiser. Closer to the bottom, you'll find air holes that double as drainers and prevent the utensils from misting up. 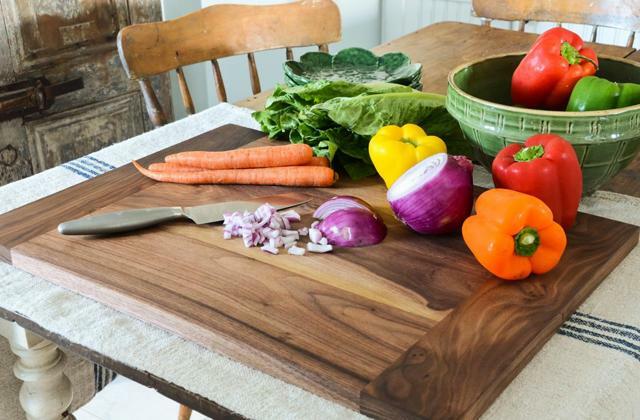 The handle can also be used as a rail for dishcloths. Larger washing-up liquids don't fit it. Addis 516436 is one of those products that you could safely recommend to practically any customer without knowing his situation, needs, or preferences. The organiser is versatile enough to fit most people and the price here is more than fair. The dividers are adjustable, the main compartment is removable, and the model's front and side rails are retractable. 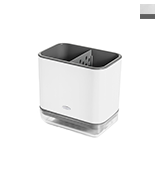 Even the base is removable, so you'll hardly have any difficulties cleaning and overall maintaining the unit. 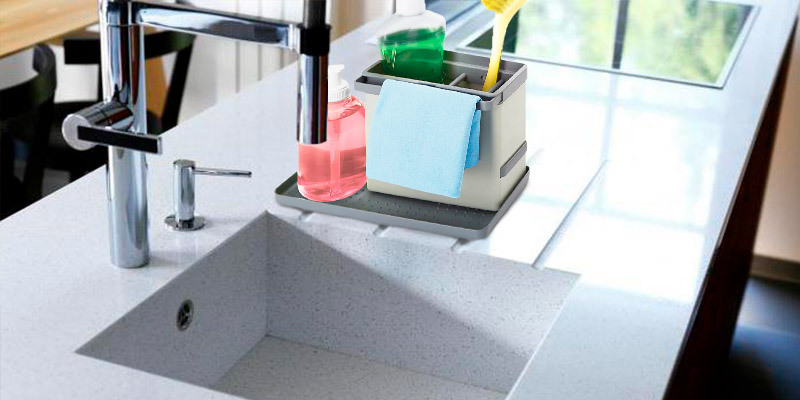 Metaltex Tidy-Tex Kitchen Sink Organiser is a little more expensive than your average sink tidy but it offers so much in return that the model is actually priced rather modestly. With it, you'll be able to always keep your cleaning tools neatly organised within hand's reach. The unit is tall enough to store long handheld tools upright and also tall enough to provide convenient access to those tools. 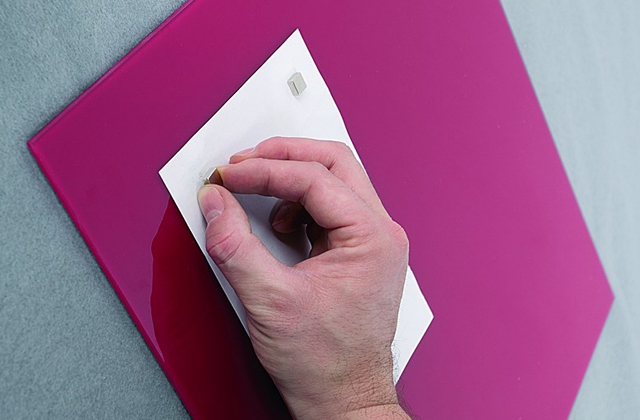 The divider is removable and perforated, a nice little design solution that prevents bacteria buildup in sponges. The drip tray is difficult to separate at first. 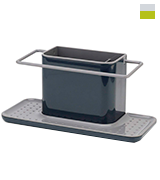 OXO Good Grips presents here a nice little sink tidy. Though not without its flaws, the model is particularly compact, it doesn't look all too bad, and it is about as practical as the next organiser. Plus, considering the size, you can use it as a toothbrush holder. Joseph Joseph 85070 is a little more expensive than every other organiser on this list but the price tag does make sense considering everything that it has to offer in return. For starters, the model looks really good, with a grey, almost silver colour scheme, polished accents, and an overall sleek appearance. 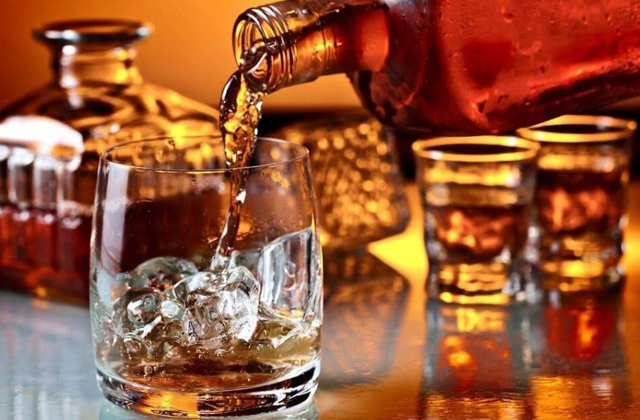 Plus, its design is as visually appealing as it is compact and practical. 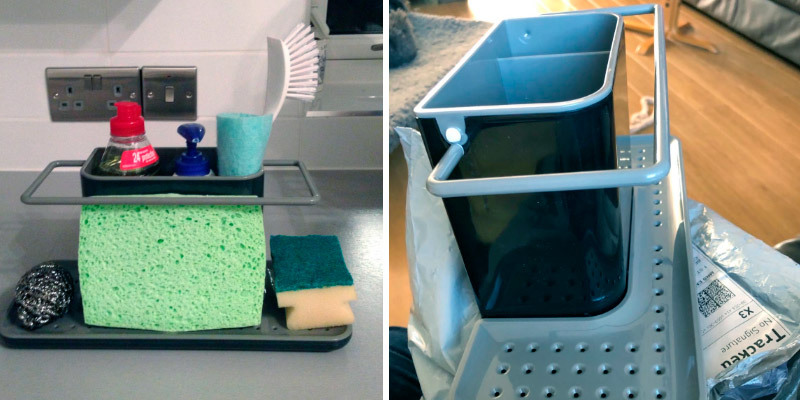 There's an integrated drainer for cloths and sponges. The main body gives you ample space, space that you can use for storing any washing-up liquid bottle and a brush. 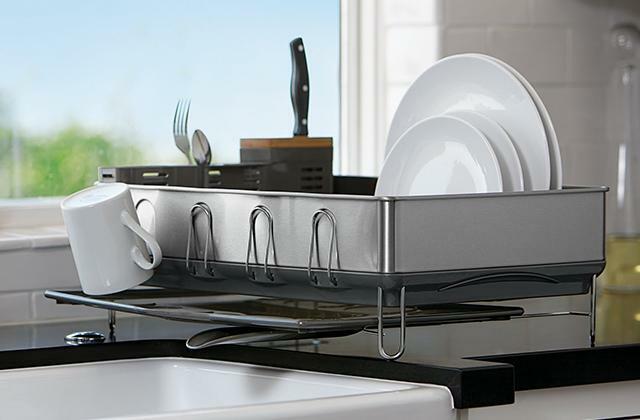 Fitted with an integrated rail, this lovely little sink tidy offers enough hanging and drying space for damp dishcloths. You can easily dismantle the whole thing and just as easily clean it. 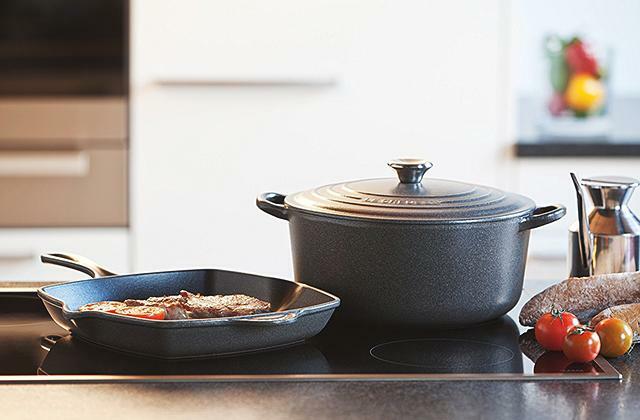 Furthermore, the model comes equipped with a double plate for sponges and scourers. The only issue we have with it is that the plate will not prove particularly suitable for larger sponges. Other than that, we have no complaints here. The unit is completely dishwasher safe and the concealed reservoir beneath it does an excellent job collecting any drained water, making it ready for disposal. In other words, Joseph Joseph 85070 is one of those products that manages being in equal parts practical and visually appealing. Provided you don't mind paying a little extra, what we have here is easily the best kitchen sink tidy on this list. First things first, this Thorness Shabby Chic Vintage product really does the name justice. 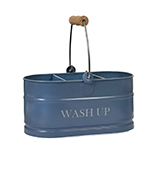 Styled to recreate that vintage mini housekeeper's utility bucket look, what we have here isn't just a little organiser that will help you keep your sink are neat and clean but a unit that will be able to add that finishing touch to a cottage vintage inspired kitchen. 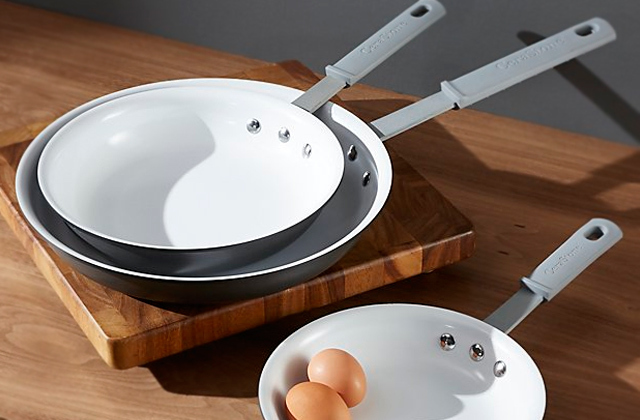 As far as we're concerned, the only flaw here is the wooden handle. 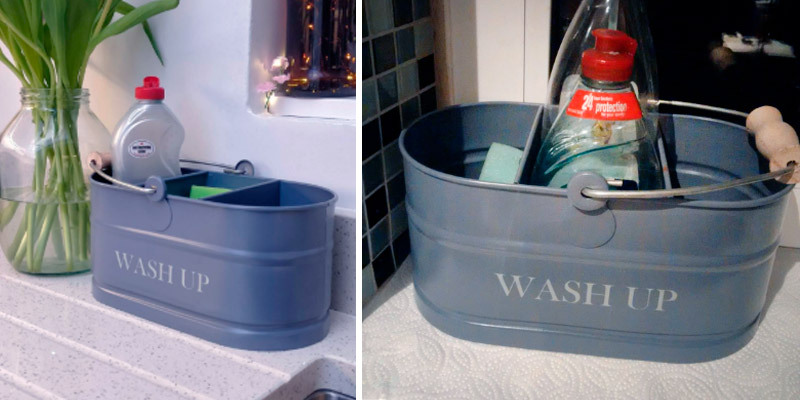 On paper, it is really practical and it definitely completes the whole vintage utility bucket look but, as you'd imagine, it doesn't work that well with moisture and you can't really expel moisture from that area. Apart from that, this is an excellent, well-thought-out product. 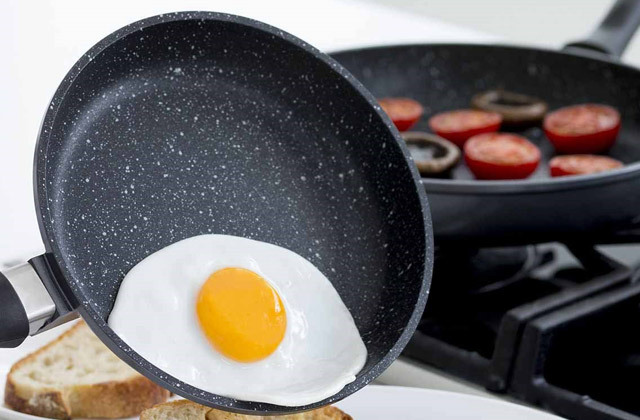 Its enamelled metal exterior is as attractive as it is sturdy, able to resist rust and corrosion, partially thanks to the powder-coated finish. The aforementioned wooden handle is foldable. The main compartment has ample space for your cleaning tools and detergent(s) as well as a divider to keep these things separated. To sum it all up, Thorness Shabby Chic Vintage Sink Tidy will work wonders for people who aren't just looking to keep the sink area neat and organised but also add a little character to their kitchen. Regardless of its interior design, the model will make a charming addition to any room. 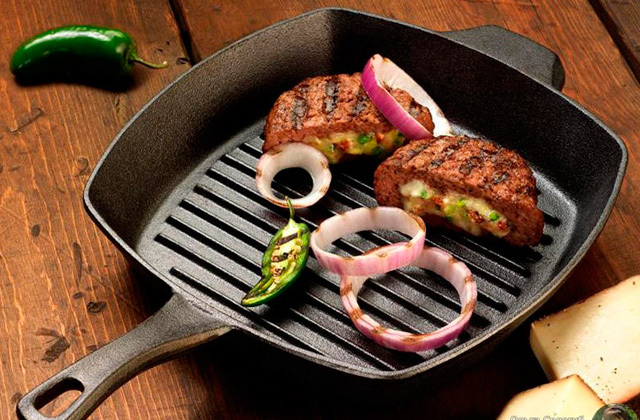 For our taste, Addis 516436 might just be the most versatile, well-balanced product on this list. Let's start with the size. 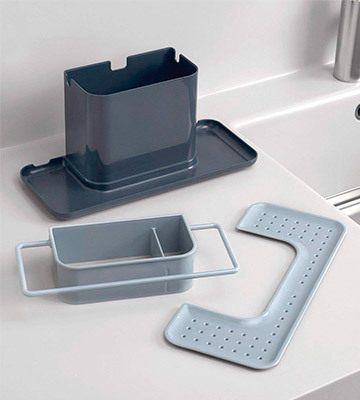 Adding up to 25 x 12 x 10.3 centimetres in overall dimensions (with a folded handle), this organiser is neither too small to fit cleaning tools and keep the sink area neat nor is it too large to take up a lot of space. But the biggest change here is the storage area. The unit incorporates its main compartment, middle insert with a divider, and a handle that can also be used as a rail for dishcloths. 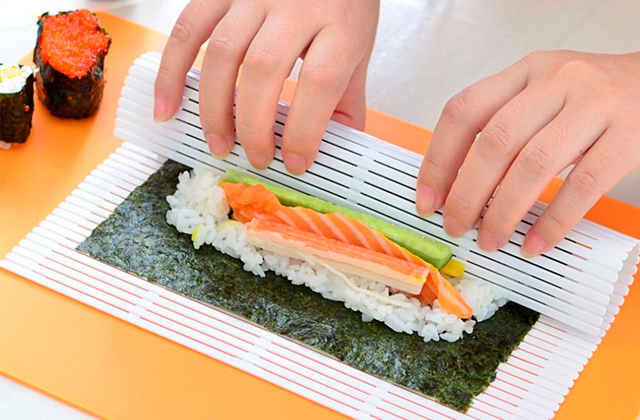 Thanks to that middle insert, among other things, the model can be used as a sink tidy and as a cutlery organiser. Sure, an approach like that isn't entirely flawless. For example, you'll hardly be able to fit larger washing-up liquid bottles inside it. But, all in all, that is a sacrifice that we're willing to make here. Closer to the bottom, you'll find air holes that double as drainers and prevent the utensils from misting up. 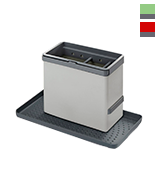 On that bottom, there are non-slip feet that keep this plastic sink tidy in place on any surface. Lastly, it is available in different colours, though we would definitely recommend going with the black grey one. Bottom line, Addis 516436 is one of those products that you could safely recommend to practically any customer without knowing his situation, needs, or preferences. The organiser is versatile enough to fit most people and the price here is more than fair. 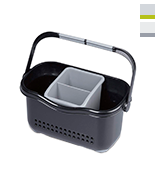 Straight away, Metaltex Tidy-Tex Kitchen Sink Organiser is an excellent sink tidy caddy. Its price usually hovers around 10 quid, so it isn't the cheapest option on the market today but it is definitely not the most expensive either. The biggest difference between this product and its cheaper and, more often than not, subpar counterparts is just how versatile it is. Equipped with its main compartment with dividers, a wide rail for dishcloths, side bracket for a sponge, and a plate for sponges and scourers, the model offers ample, separated space for every cleaning tool in the book (the metaphorical book that pertains to the sink area, of course). Is that something entirely new? No, not necessarily. However, here, the dividers are adjustable, the main compartment is removable, and the model's front and side rails are retractable. 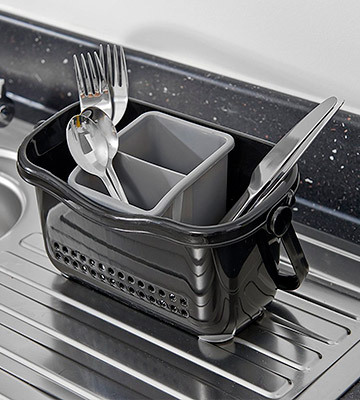 Needless to say, a design like that means that you will always be able to fit practically any tool, utensil, or any other kitchen/sink related item into the organiser. Of course, it doesn't hurt that the whole thing is easy to clean and, measuring 24 x 13 x 14 centimetres in overall dimensions, doesn't require all that much space either. 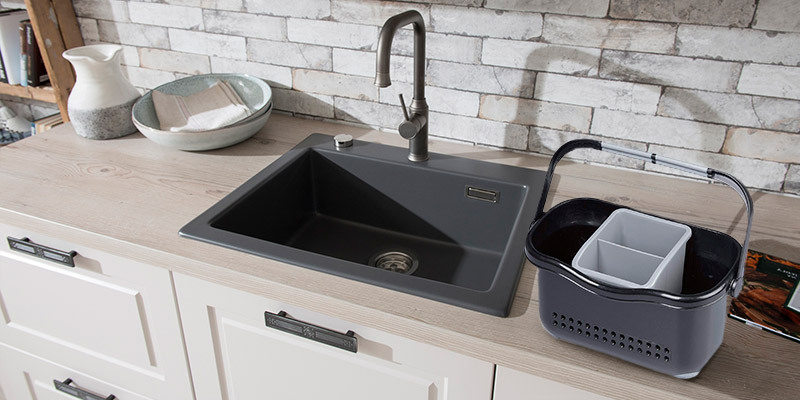 Long story short, Metaltex Tidy-Tex Kitchen Sink Organiser is a little more expensive than your average sink tidy but it offers so much in return that the model is actually priced rather modestly. 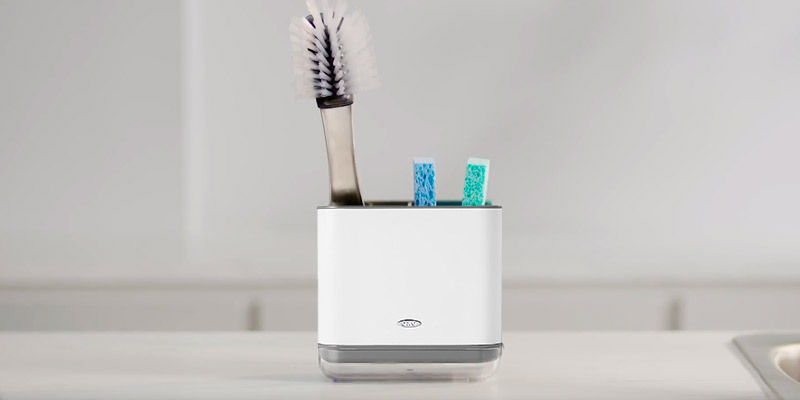 With it, you'll be able to always keep your cleaning tools neatly organised within hand's reach. 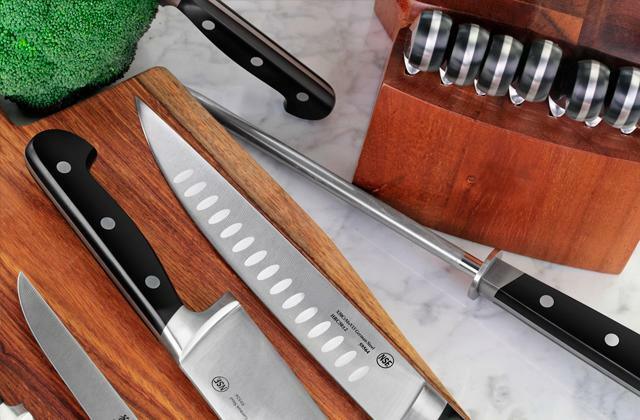 On one hand, this OXO Good Grips is one of the more basic models on this list. All we have here is a single compartment with one divider, so you won't be able to separate all that many cleaning tools. On the other hand, its minimalistic design is well thought out and just as well-executed. It is tall enough to store long handheld tools upright and tall enough to provide convenient access to those tools. Nevertheless, the unit adds up to just 14.2 x 9.7 x 14 centimetres in overall dimensions, making it easily the most compact organiser here. The aforementioned divider is removable, which is good considering just how small the whole thing is. Furthermore, the divider is perforated, a nice little design solution that prevents bacteria buildup in sponges. Fitted with drain holes, the model lets water from brushes and sponges drain right into the drip tray. This bottom tray is removable as well, so you shouldn't have any issues keeping this sink tidy clean. Plus, considering its tiny size, you can just as well use this organiser as a toothbrush holder. 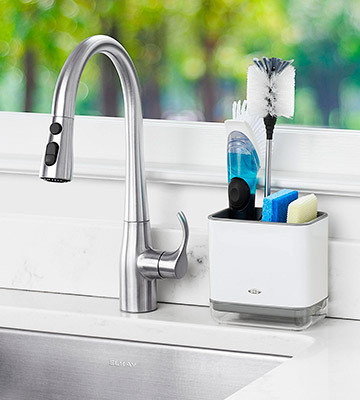 In short, OXO Good Grips presents here a nice little sink tidy. Though not without its flaws, the model is particularly compact, it doesn't look all too bad, and it is about as practical as the next organiser. What Is a Sink Tidy? Keeping your tableware nice and clean is important for a number of reasons and we hardly need to elaborate on those reasons. That being said, to keep them clean, you'll need to keep your sink just as clean. To do that, all you will need is a small organiser where you can fit and store the washing-up liquid, sponges, scourers, and other cleaning tools. These organisers are sometimes referred to as sink caddies or a sink area organisers but, more often than not, people simply call them sink tidies. What it is is a nice little item with different compartments, plates, and rails that will help you keep the aforementioned cleaning tools well-organised. Sometimes, they're made of plastic. Other times, the manufacturers go with metal and wood. These things are exactly all that complicated or convoluted but there are smaller things and little details that make different products better, or, at the very least, more suitable for slightly different needs and purposes. Try to keep those details in mind and you should be able to pick out the right sink tidy. 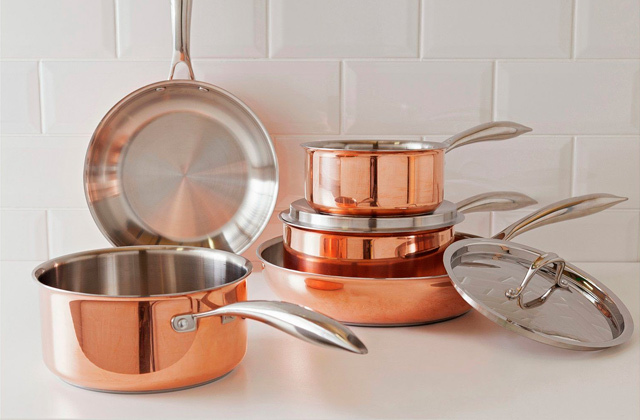 Keeping cookware and glassware neat and organised is important too. With a new dish rack, you should be able to do just that.